A collection of novelty toys and garments. 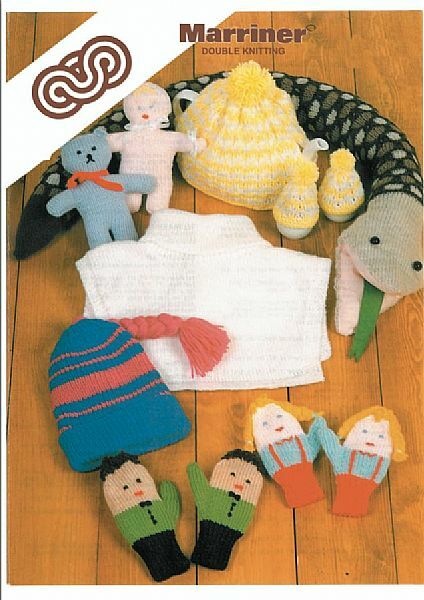 Knitted in Dk yarn, this assortment of items have a vintage look to them and are ideal to use our 100g balls of DK yarn. Hooks required Mittens: 1 pair size 3 mm (No 11) and 1 pair size 3 3/4 mm (No 9) Knitting needles or the size of needles to give correct tension. Cap: 1 pair size 4 mm (No 8) Windcheater: 1 pair size 3 1/4 mm (No 10) and 1 pair size 4 mm (No 8). 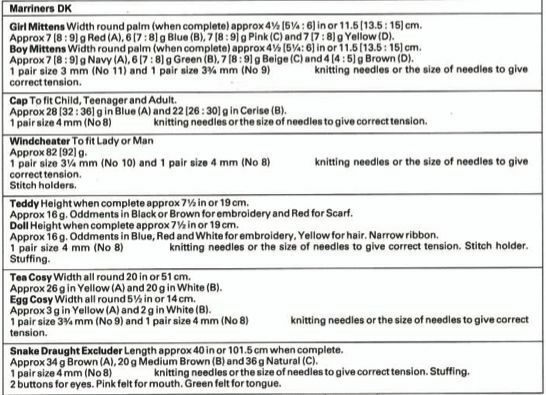 Teddy and Doll: 1 pair size 4 mm (No 8) Knitting needles or the size of needles to give correct tension. Stitch holder. Stuffing. Tea cosy & Egg cosy: 1 pair size 3 3/4 mm (No 9) and 1 pair size 4 mm (No 8). Snake Draught Excluder: 1 pair size 4mm (No 8) Knitting needles or the size of needles to give correct tension. Stuffing. 2 buttons for eyes. Pink felt for mouth. Green felt for tongue.